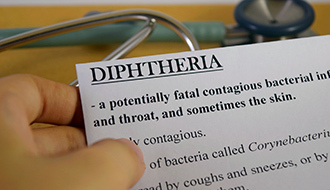 Diphtheria is a highly contagious bacterial infection that can develop fatal complications. It can be treated with antibiotics but needs to be caught early. Vaccination is highly recommended, especially for children. The symptoms of diphtheria include a thick, grey-white coating which develops inside the throat, covering the tonsils and back of the throat. This coating can make breathing difficult. 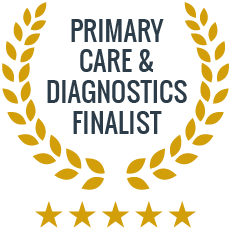 In addition, other symptoms may include a fever of 38C (100.4F) or higher, fatigue or exhaustion, sore throat, cough, chills, headache, difficulty or pain on swallowing, bloody or foul-smelling nasal discharge, swollen neck glands, and cyanosis (bluish skin). If diphtheria affects the skin (cutaneous diphtheria), pus-filled spots will appear on the skin of the limbs and hands and develop into ulcers, which may scar. Sub-Saharan Africa, parts of South East Asia and South America. Diphtheria is caused by bacterial infection, and it is highly contagious. It is spread through the sneezing and coughing of someone who has the disease, or through contact with them or with bedding and clothing belonging to them. It is more common in countries where vaccination is rare, such as Africa, South Asia, and the former Soviet Union. If you would like to discuss vaccination options for diphtheria for you or your child, or are concerned about any symptoms you are having, please call us or use our online booking system to make an appointment. 1 injection is necessary for full immunisation. Are there any potential complications with diphtheria? Diphtheria can cause problems with the heart, nervous system, or respiratory system. If the infection spreads into the lungs, they can become broadly inflamed, leading in some cases to respiratory failure, when the lungs lose their normal function. If the diphtheria toxin affects the heart, myocarditis (inflammation of the heart muscles) can develop. What is the best way to prevent diphtheria? Keeping up to date with diphtheria vaccination is the best way to ensure prevention. It is usually recommended that both adults and children have five doses of the vaccine to be safe. The first step with a diphtheria infection is isolation, as the disease is highly infectious. Antibiotics and antitoxins will also be prescribed, which kill the bacteria responsible and ease the symptoms of the disease. Antibiotics will usually be taken for 14 days.